Hardcover, 11.5 x 11.5 in. / 120 pgs / 68 color / 1 bw. Introduction by Bridget L. Moore. Text by Michael D. Hall, Nannette V. Maciejunes, Karli R. Wurzelbacher. One of the great American Modernist artists, Charles Burchfield (1893-1967) is often associated with the romantic nature fantasies he produced in his later years, but his earliest engagements with Modernism are often overlooked. In Charles Burchfield 1920: The Architecture of Painting, the importance of this phase is examined for the first time. Assembling a tight group of Burchfield's watercolors, it highlights works executed between 1918 and 1920, which depict the stark houses and industrial landscapes of Burchfield's Salem, Ohio. These watercolors employ certain hallmarks of Modernist pictorial strategy, such as flattened space, reductive simplicity and industrial themes, but without the crisp Precisionism of a Demuth or a Sheeler--rather they convey Burchfield's simultaneous engagement with Folk Art and Expressionism. 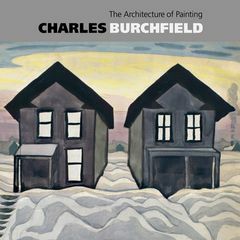 By positioning this period as integral to (rather than anomalous within) the trajectory of Burchfield's career, the insights of authors Michael Hall, Nannette Maciejunes and Karli Wurzelbacher here provide a richer understanding of Burchfield's art. FORMAT: Hbk, 11.5 x 11.5 in. / 120 pgs / 68 color / 1 b&w. Published by DC Moore Gallery.